In the Battle Dome, the trainer is placed in a tournament with 15 other people. He/she has to progress through the first leg, quarterfinals, semifinals, and finals of the tournament to become the Champion of that challenge. The trainer can choose between single or double battles, and then pick a team of three Pokémon to battle with. The trainer can see the opponents' Pokémon and one move from each of the Pokémon. Before each battle, the trainer selects two of his/her Pokémon to fight. The trainer can even see their record throughout the tournament. Once the trainer is done, he is led to an actual arena where the battles ensue. After five and ten tournament wins (single battle only), the trainer can fight Dome Ace Tucker. 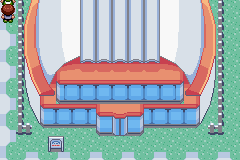 He surrenders the Silver or Gold Tactics symbol, depending on whether this is the trainer's first or second time to come across him, respectively. He wields a team of Pokémon that counterbalance each others' weaknesses, to take advantage of the two-Pokémon only rule. Tucker's name is from tactics, the thing the Battle Dome tests. This page was last edited on 19 March 2010, at 06:54.